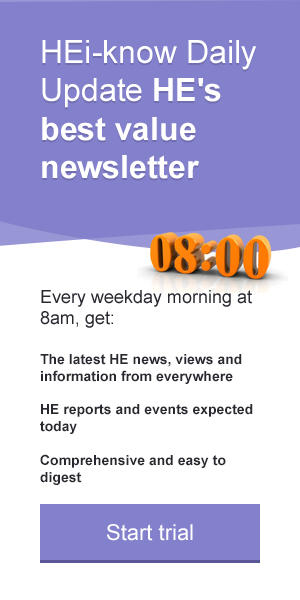 HEi-know Exclusive: New guidance on vice chancellors’ pay, covering transparency, publication of pay differentials and membership of remuneration committees, is to be drawn up by the Committee of University Chairs (CUC). The move follows universities minister Jo Johnson’s call for a “remuneration code” to be developed. Greater emphasis on impact in the next Research Excellence Framework may worry some academics, but it provides the higher education sector with a valuable opportunity to promote itself in response to recent criticism, argues Professor Nick Talbot, Deputy Vice-Chancellor for Research and Impact at Exeter University. The long term cost of writing off graduate debt after a general election in five years would be up to £80 billion lower than some politicians and commentators have claimed, an analysis by the Institute for Fiscal Studies. HEi-know invited three vice-chancellors to give their "take away" thoughts from last week's Universities UK annual conference, where universities minister Jo Johnson announced new measures on the Teaching Excellence Framework, degree classifications, and executive pay. Enhanced horizon scanning for higher education professionals. Watching Brief is a feature of the HE intelligence service HEi-know . New figures suggest that more graduates are finding employment or going on to further study. But there are trends within the statistics that raise questions about the direction of the graduate labour market and that could cause concern for the future, warns Stephen Isherwood, Chief Executive of the Association of Graduate Recruiters . As UK higher education enters a period of unprecedented change and uncertainty, Tony Strike, University Secretary and Director of Strategy at the University of Sheffield, says that more than ever before universities need reliable practical tools to guide them through the challenges they face. Many UK universities have fallen further behind international competitors in the latest edition of the QS World University Rankings. The “ivory tower” is a tired label that fails to capture the complex and deep relationship between universities and the cities where they are based, according to a British Council study. British Council calls for end to TNE terminology "chaos and confusion"
The huge expansion of transnational education (TNE) has created many fresh opportunities but has brought with it a “terminology chaos” that is creating “mass confusion and misunderstanding”, said the British Council as it published a new framework to define and standardise the terms used for different models of international education. Higher education leaders from across the globe are gathering in London this week to attend the British Council’s Going Global flagship international higher education conference, the first since the Brexit vote. Collaboration between universities and business is growing, according to a new report from the National Centre for Universities and Business. Shivaun Meehan, the NCUB's head of communications, outlines the report's findings and its recommendations for building on the progress. HEi-know talks to Professor Liz Barnes about the challenges facing her as Vice-Chancellor of Staffordshire University after a year of significant change for the sector. Scheduled pay talks between university employers and the higher education staff unions have resulted in an offer of a minimum of 1.7 per cent. The Government’s industrial strategy takes insufficient account of Brexit and its effect on the regulatory regime and research and trading relationships, according to a committee of MPs. The University of Leicester has announced plans to open a campus in China in September that will offer dual degrees for UK and Chinese students. Sending personalised letters from student role models to teenagers from poor backgrounds increases the likelihood of them applying to selective universities, a government trial has shown. 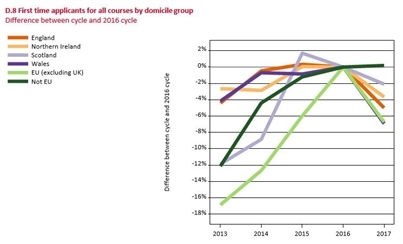 Applications to higher education teacher training in England and Wales have fallen by nearly 10,000 in a year while the number accepted onto courses dropped by 12 per cent, new figures show. 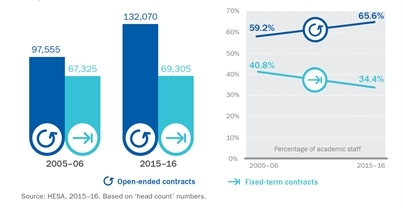 There has been an increase in the proportion of academics on permanent contracts over the past decade, university employers say. But the figures have been disputed by the University and College Union, which has described them as “deeply misleading”. As the deadline passes for responses to the consultation on the next Research Excellence Framework, Kim Hackett, REF manager at the Higher Education Funding Council for England, outlines some of the key issues that have emerged so far. As both the Budget and the recent grant letter to HEFCE reiterates the government’s call for universities to work more closely with, and potentially sponsor, schools (see HEi-know Briefing Report 336 ), HEi-know finds examples of close collaboration already taking place. A £392 million government investment in the Midlands from the local growth fund to create a "Midlands Engine" has helped the University of Leicester and partners launch plans to develop a National Space Park. Pam Tatlow, chief executive of MillionPlus, outlines the arguments in a new report calling for local authorities and agencies to work with modern universities to help unify efforts behind the government’s devolution agenda and industrial strategy. The Higher Education Academy has announced the official launch of the Global Teaching Excellence Award – believed to be the first global accolade to recognise universities demonstrating world-class commitment to teaching and learning excellence. HEi-know looks at how higher education leaders think Sir Mark Walport and Sir Michael Barber may respond to the challenges they face as heads of two new key HE bodies – UK Research and Innovation and the Office for Students. As the Higher Education and Research Bill completes its committee stage in the House of Lords and approaches report stage, HEi-know looks at amendments tabled and issues raised so far, and hurdles still to be cleared. Applications for full-time undergraduate places at UK universities have dropped by 5 per cent from home students and 7 per cent from EU students, new figures from UCAS show. As a new report from the Higher Education Policy Institute calls for HE institutions to embrace new technology, Ed Foster, Student Engagement Manager in the Centre for Academic Development & Quality at Nottingham Trent University (NTU) , and Jane McNeil, Director of Academic Development at NTU, warn that technology alone cannot improve learning. John Lonsdale, Director of Innovation and Enterprise at the University of Central Lancashire, assesses the opportunities for universities in the government’s new industrial strategy. Higher education leaders have warned that “fundamental flaws” in the proposed metrics and ranking system for the forthcoming Teaching Excellence Framework could make the TEF “unsustainable”. Universities have objected to plans to scrap the taught postgraduate supplement for clinical, high and intermediate-cost subjects. Universities minister Jo Johnson has announced amendments to the Higher Education and Research Bill tabled as the government prepares to steer it through a crucial stage in Parliament. The House of Commons education select committee has launched an inquiry into value for money in higher education. A new policy briefing from MillionPlus, highlights the key issues that the UK’s representatives need to negotiate to ensure that UK and EU students can continue to study in each other’s countries and that the UK’s universities can continue to trade in Europe post-Brexit. The University of Leicester is preparing to open its first international Institute in China this month. The Institute, which will offer duel degree in STEM subjects to both Chinese and UK students, is the result of a partnership between Leicester and leading Chinese University - Dalian University of Technology. Closing the higher education gender pay gap will take 40 years, a new report suggests. Birmingham University is to open a new campus in Dubai, the latest UK institution to tap in to potentially lucrative markets overseas. Unite Students has published what it describes as the "first in-depth UK report on student resilience". Authored by Dr Emily McIntosh from the University of Bolton and Jenny Shaw from Unite Students, the report draws on a large survey dataset and an extensive literature review to provide a fresh definition of resilience. A partnership between Lancaster University and a cultural organisation has won an award from Curious Minds for developing arts, education and learning in Lancaster. Sculptures by the Icelandic artist Steinunn Thórarinsdóttir have been installed at Hull University, forming a trail around the campus. It is part of the programme for the Hull UK City of Culture 2017. The university is a principal partner for the year and the art works celebrate ties between Hull and Iceland. A new £9.1 million digital media hub is under construction at Nottingham Trent University. The development of the Confetti Institute of Creative Technologies will link two sites with a seven-storey education centre. A project set up by the University of East Anglia (UEA) which helps businesses to develop in environmentally-friendly ways has launched a second investment cycle. STV’s new channel, STV2, which has a studio at University of the West of Scotland’s Ayr Campus, has been launched to viewers across Scotland. The University of Leicester has received its biggest ever single gift from a private individual - £2.7 million- which will be used to fund life-saving kidney research of global significance in the College of Medicine, Biological Sciences and Psychology. The Midlands Innovation group of universities, including Leicester University, and Queen Mary University of London have been awarded £3.2million from the Engineering and Physical Sciences Research Council (EPSRC) to establish HPC Midlands Plus – a centre of excellence in high performance computing (HPC). Lancaster engineers are part of a team which will map some of the world’s most radioactive sites using sensing technology mounted on an advanced robotic vehicle. The University of Sheffield’s Sheffield Water Centre, has been awarded £3.7 million to develop new scientific ways to manage distributed water infrastructure. The CanTest project, which involves researchers at the University of Exeter, Cambridge, UCL and Leeds, and a number of international institutions, has been awarded £5 million as part of Cancer Research UK’s Catalyst Award. The project will investigate ways of bringing new and improved cancer diagnostic tests to GP surgeries. A £130 million investment in student residences at Hull University will help meet the growing demand for high-quality accommodation. Leicester University is involved in a new £15m project funded by the UK Space Agency to help to protect tropical forests throughout the world. A partnership of three research institutions, led by Exeter University, has secured a £5m award to help protect local natural resources and the jobs dependent on them in the South West. Sheffield Hallam University has launched an international academy to support new research and policy in efforts to reduce drug and alcohol dependency and aid recovery. Hull University has been awarded £500,000 by the Premier League & The FA Facilities Fund to help create a new football hub as part of a £15 million investment in the University’s sports facilities, currently underway. Glasgow Caledonian University (GCU) has launched its new conference and event facility – a showcase space in the University’s £32 million campus transformation. De Montfort University’s £3 million renovation of its campus centre has reached completion.